Conley Equipment Company is your trusted battery supplier that serves clients nationwide. With big name clients like AT&T, Centurylink, Comcast, Chevron, and more, we’ve made a name for ourselves as a top-quality telecommunications battery products and services leader. One of the ways we’ve been able to position ourselves as leaders in this industry is through our Partnership with East Penn Manufacturing. We are the largest value-added reseller for East Penn Manufacturing in North America. Conley is especially proud of our relationship with East Penn because we believe in their products. Not only do they have hundreds of awards for manufacturing and environmental excellence, we’ve used their products first-hand and can attest to the value they provide. The Deka Unigy I series also boasts an exclusive IPF® technology which optimizes power capacity, long-term reliability, and cell consistency. This is just one way East Penn Manufacturing is pushing the bar forward in innovation and reliability. Choosing an East Penn Manufacturing telecommunication battery through Conley Equipment Company means your system will be powered by a name you can trust. 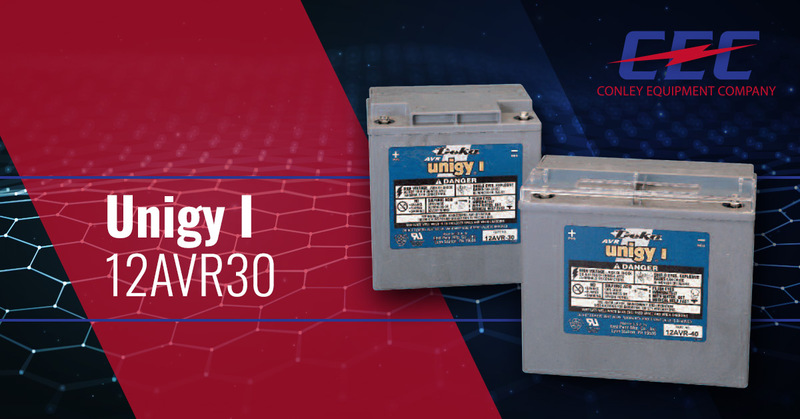 Please fill out the contact form on the right to get a free quote on a Unigy I – 12AVR30 battery. Or if you’d like some additional information or need to talk to one of our experts, please don’t hesitate to contact us. You can also read the cut sheet for the East Penn Unigy I – 12AVR30 battery for additional helpful information and specifications.